Wangfujing (王府井, Wángfǔjǐng in Chinese) is a long street in Beijing's Dongcheng district immediately east of the Forbidden City with a large pedestrian area and many shops and department stores. It was open to the traffic until the year 2000, when a large section was transformed into a pedestrian area. Wangfujing extends from the Oriental Plaza malls in the south until St Joseph's church in the north. The area attracts tourists who find plenty of shops and souvenir stores. 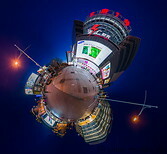 Inhabitants from Beijing however avoid shopping in Wangfujing because of the inflated prices. Wangfujing is easily accessible by public transportation (bus, metro, taxi), although it is difficult to find a taxi once in Wangfujing.